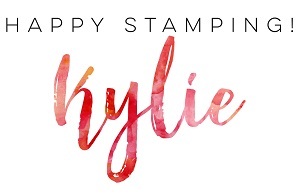 Hi everyone, today I’m sharing part one of a technique which seems to have captured the attention of everyone in the stamping industry. It was originally, as far as I can tell, shared by Jennifer McGuire. It was a little fiddly for me but it was well worth the effort. The card I am sharing today was my first attempt at this technique – Floating Die Cut Frames – and I definitely don’t think it will be my last. Most of the examples of this technique I have seen so far seem to have used floral images but I thought it might be fun to use butterflies. Out came the cute Butterfly Gala stamp set and coordinating craft punch (also available as a bundle). I began by stamping up a lot of the butterfly images in Memento Black Tuxedo ink. Next up I stamped the images using the Rock & Roll Technique. 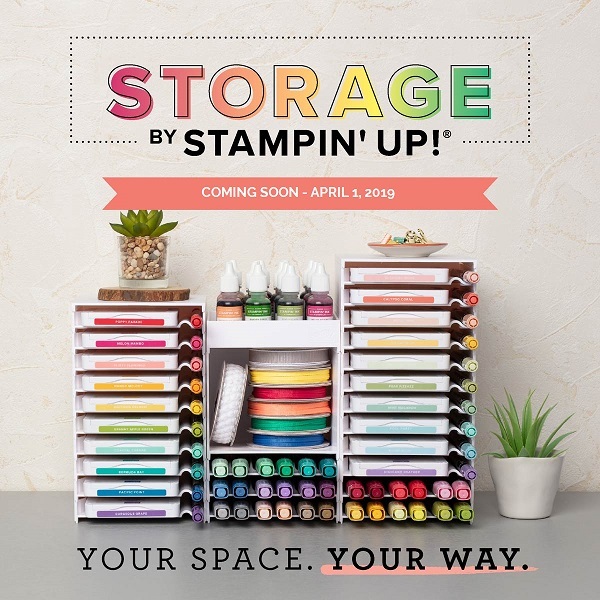 This is where you ink up a solid image in a light colour and then gently rock and roll the inked up stamp in a darker colour. It’s an easy way to add shading. I then punched out all of the butterflies before positioning them onto a piece of cardstock which had been cut to the size of the front of my cardstock base. After I was happy with the spacing, I took a piece of Press ‘N Seal and covered this panel. I used two rectangle dies from the Rectangle Stitched Framelits to create a frame over the panel and ran it through the Big Shot. This created two pieces – a large frame and a rectangle panel (check back tomorrow to see what I do with the rectangle panel). It was at this point, I separated my butterflies/Press ‘N Seal from the backing cardstock. I used this offcut piece to enable me to position the sentiment from the Perennial Birthday stamp set. I heat embossed this sentiment. 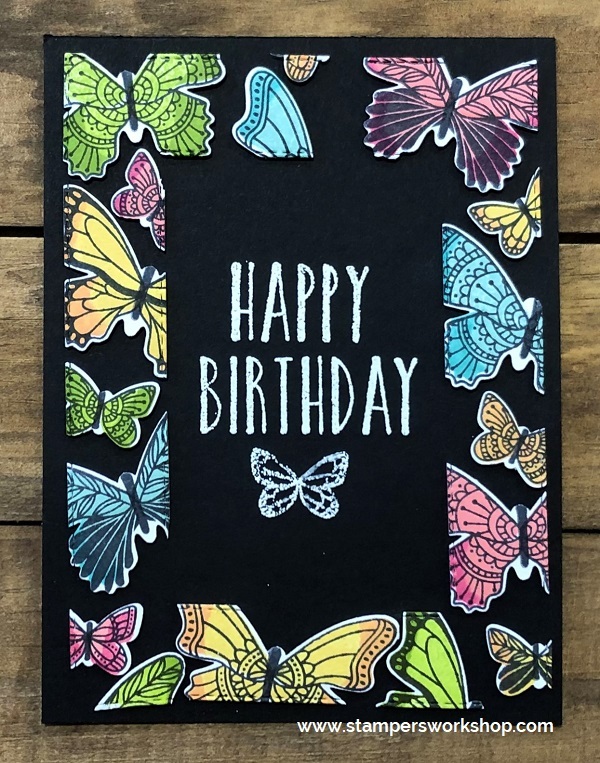 The next step was to add Stampin’ Dimensonals to all of the butterflies before turning over the butterflies and adhering them to my card base. I did drop the panel which meant my frame was a little wonky but it isn’t too bad. My other mistake was that after I had adhered all the butterflies, I decided I needed to add a little something extra to the sentiment. I didn’t quite get my embossing perfectly. Next time, I’ll complete all the heat embossing before sticking down my ‘floating frame’. I have to say, I really like this technique. It was a little fiddly but that could just be because I’m all thumbs. I also really liked the colour of the butterflies against the black. I have only seen examples where a white background has been used. I would also recommend not leaving the Press ‘ N Seal on your paper for any longer than you need to. It might have been the age of my roll (I’ve had it for a few years) but I nearly tore some of my butterflies. Just go slowly when you try and move it so you don’t ruin all your hard work. So, will you try this technique? If so, please share what you create. I’d love to see your creations.